Ample evidence in this film to make P.J. a full-time rollout passer as we’ve been saying all year. Up 13-0, you’ve got to win the game. So, how do you not? The first and most important is that you cannot come up with empty possessions. An empty possession is one without a field goal or a touchdown and, after 13-squat, the Owls came up with seven empty possessions. Watching on TV, it only seemed like 70. Phillip Walker had a career night with over 400 yards worth of passing, but most of those 400 yards were needed with a 13-0 lead and the Owls were way too comfortable walking off the field as it went to 13-3 and 13-6. For the Wildcat to work, got to throw off it from time to time. There has got to be a greater sense of urgency at 13-0 than there was Thursday night. The body language was “la-dee-da, we’ll get them next time” but, in big-time college football, there is no next time. The sad truth is that there will be no AAC championship for the Owls this season and it was left on a football field in Memphis when the score was 13-0. They had a chance to put the hammer down and make it 20-0 and 27-0, but refused to see how important that was. You can talk all you want about a kickoff return for a touchdown or two long touchdown runs before that, and even the two missed field goals from a guy who had hit 17 in a row (I know, the announcers should have never mentioned that), but this game, this night, was lost when it was 13-0. The Temple coaches were far too comfortable is “managing” the game at 13-0 rather than putting it away when the pedal needed to be put to the medal. Nick Sharga and Brian Carter, two standouts in their limited time on defense stopping the run up the middle, were nowhere to be found and the Owls were gouged up the middle late without them. Does this coaching staff even know they are on the team? From the 120 yards in penalties at Penn State to the horrific defensive game plan against Army’s triple option, to the lack of killer instinct at Memphis, one thing is clear about this 2016 version of the Temple Owls. This is a poorly-coached football team. How does Memphis hire a 34-year-old guy with no head coaching experience who goes 4-1 when the same guy Temple hired in his first year went 2-10? You thought Memphis would have the coaching growing pains, not Temple. Turned out the opposite was the case. The Wildcat Offense is an absolute joke when you have someone running it who has not demonstrated he can complete a pass out of it. What do you think the scouting report for Temple is when Isaiah Wright comes into the game? That he’s going to throw the ball? They just load up on the run. Late in this one, I thought the law of averages would catch up to Temple and the Owls would be the ones benefitting from a Hail Mary pass instead of the ones suffering from it (Fordham, Buffalo, UCF). Instead, this game was lost long before then when the game was sitting on what turned out to be unlucky 13. Now the only thing left is to figure out what crummy bowl game the Owls will be sent to, if indeed they are that lucky. Even before the game, not a whole lot of belief in Temple anymore (Sad). This entry was posted in Temple football, Uncategorized and tagged Isaiah Wright, Temple football. Bookmark the permalink. Mike, spot on analysis and a big issue I’m seeing with some of the points you highlight is how there seems to be an attitude of “acceptance”. Great example of this is a pretty spirited discussion over on Owlsdaily with folks who are taking your position and those who seem to think this kind of mediocrity is “progress”. I’m tired of this “boo hoo we lost so many starters”, as we lose to a rookie coach and a team that lost one of the top QBs in FBS last season. They seem to be picking up where they left off last year and seem to be headed for their 3rd 9 win or more season. That to me is a program that is building!! Is it time to view 2015 as “fools gold” and resign ourselves to the fact that this program looks like at best it will be a middle of the road AAC team? The lack of ability to move the pieces you have into parts of the puzzle that they fit better (Sharga from FB to LB and Carter from not being even used as an OG to the DT spot he was good enough to start over Ioannidis at one point) is a real head-scratcher and shakes my already slim confidence in this staff. I believe Matt’s intentions are great and he wants to win more than any coach since Arians, but he does not have the Arians’ “how-to.” Golden was a great CEO and recruiter and lousy game coach and Rhule is proving to be a similar type individual. (Although Golden might have been a better recruiter.) I guess that’s the best Temple can hope for, but loving Temple as I do I aspire for better. I don’t think the administration does,, though. Retired for the night at half time. Was not happy with the 3-man rush on the last drive that allowed Memphis to kick the FG. Why, why, why did Snow do that??? That’s what puts good thoughts in their heads, especially when they would be receiving to open Q3. One of the worst ref calls came on that play as Ferguson’s knee was clearly down before the FG that made it 13-3. Not sure if it would have made a difference. I pointed out before this game that we have a tendency for giving up long runs up the middle and gave a constructive fix (Sharga and Carter) that needed to be at least tried. The fact that we don’t even try to fix a recurring problem is beyond incomprehensible. We were lucky last year, think of the Massachusetts game, this year we are not, think of all the calls (and non-calls) last night that could have gone the other way. This team and the coaching staff are just not good enough to overcome bad breaks. We let so many opportunities get by us. What a game, some amount of vague hope, but by half time chock-full-of reality. This is a not too good of a team, with a not too good coaching staff, making not-too-good decisions. And icing on this SH-T-PIE is a continuing to decline not too good SENIOR QB who is in love with throwing into coverage. Interceptions are us. He has no deep field vision and throws a flat pitch. The last best chance of a resurgent Temple Football hopes is Gone-with-the-wind, like the bad gas I smelled with most of this season’s games. What were they Think-en ? I may not even go to many more games even with my season Tixx. After Walkers freshman year I thought he was going to be a star dual threat QB. Now he is getting run down by 300 lb D-Linemen, he constantly makes bad decisions, inaccurate throws, throws into coverage, overthrows recievers, alot of his balls are batted down by lineman and he throws WAY to many picks. Stat wise he is the best QB in temple history but in my opinion he has declined and was a better QB his freshman year. It’s to late in the season to burn Russo’s red shirt but I’d like to see Marchi or Nutile in there the rest of year because Walker isn’t playing like a 4 year starter. 9 INT’s in 6 games is just unexceptable. Walker does have 60 career TD passes but he also has 40 INT’s. Not a good ratio. It’s one thing if he was able to be the dual threat QB we seen his freshmen year but now it looks like he is lugging a piano everytime he runs. I’m not putting this all on Walker but when your the senior leader and 4 year starter you need to play much better. When Memphis fumbled that kickoff and temple got the ball at the 6 yard line and couldn’t score a TD I knew then they would lose. A good QB finds a way to get the ball in endzone there. To be fair, the receivers did drop quite a few. As did the Memphis receivers. That happens every game to every team. Those are things you can’t control. Better play-calling after recovering a fumble deep in the bad guy’s territory are things you should be able to control. Correction please, Mike on my first post here. This is not a bad team, I see lots of good play from many players. I mean to say I think the coaching or their decisions are not the best and that is a primary cause for a not too good team based on results. This is a short WHY list ????? Why so many runs up the middle for little or nothing gained. Why so often late game defensive lets downs. Why does QB who I saw hesitate many times yesterday, in the middle of executing the plays, both on his runs and passes. I suppose bad luck is just as responsible along with bad calls by refs ? The game mirrored SFU last year. Instead of getting TDS, we got field goals early and the Owls inexplicably gave up long runs up the middle. The last thing is inexcusable. Don’t understand how a power back can go all the way running up the middle. And yet as badly as the Owls were they could have won had Walker not forced the last ball and Jones makes those field goals. Couple bad play with horrendous refereeing it spells L-O-S-E. At least five times the announcers pointed out missed calls by the refs that would have gone in TU’s favor including the running into the punter call and the leaping non-call. Finally, the killer was the kick return for a td. Why not squib it. And even on that play there was no call for the block in the back on the kicker. John those are all valid points and as you say a couple things break the other way and this game could have ended up in the W column. My bigger question, aside from the officiating, is everything else you mentioned more a longer term symptom of the direction of this program. I really think these last 6 games will give us a better long term view if Temple is building to be at least among the top of the conference or just good enough to keep going to the Boca Raton bowl. I look at the remaining schedule Memphis has and even if they go 4-4 that is an 8 win potential 9 win season again. What does everyone think Temple’s chances are to finish the season 6-0, 5-1, 4-2 versus 3-3. Even at 7-5 I think that is too much of a drop off from last year to not question where this program is headed. I think that for the season not to be considered a step back, the Owls have to finish 5-1 with a bowl win. 8-4 look so much better than 7-5. It is vitally important they do so after the loss to Army. Ruhle’s admission this week that the Army loss was on him makes me think that after three years he has not sufficiently progressed as a coach because he still makes elementary errors. Not throwing a pass longer than 15 yards or using a stack defense with linemen in the A gap in the Army game were huge mistakes.Many people on this blog immediately recognized those mistakes. If anyone thinks that the head coach is not important just look at Miami. Golden was a great off the field coach but horrendous on game day. The new guy using Golden’s recruits has them quietly back in the top ten. Golden, I submit, would not have them there. TU can’t wait much longer for Ruhle to get “it” if they have hopes of getting into a P-5 conference. That seems to be the prevailing thought over at Pravda. The typical post-game presser question after Army by Pravda’s editor is: “Is it frustrating the players didn’t perform the way you expected?” when Shawn Pastor gets to the heart of the matter: “Why didn’t you play 8 in the box against Army?” You’ll never come out and find a single article slamming the coaching over at Pravda, even though it is crying out to be slammed. Zach Gelb destroyed the coaching after the Houston game and his credibility went through the roof with me after that. we’ll beat ECU and Tulane and be double digit underdogs against USF and Cincy.., time to start playing as many underclassmen as we possibly can because the next recruiting class will be “average” at best..
Must split with Cinci and USF, worst case period!!! As John posted anything less than 8-4 is a step back and does last year’s 10-2 season start to look like the false hope Jery Berndt’s first year 7-4 record did. What’s next the return of the Monkees post game concerts!!! Cherry and White are the best colors in college football. We are lucky enough to have them. We should use them. We are now 2-6 wearing black uniforms. Bad Karma. It’s inexplicable that this team doesn’t have a better record because it is the fastest TU team in history. In addition, coming off the most successful season ever, one would think there would have been momentum coming into the season. The team simply wasn’t ready for Army. Call it overconfidence or under coaching it doesn’t matter because they got beat up. The PSU and Memphis games should have been wins. For whatever reason this team has catastrophic failures. They play dominating football and then allow a long run because of a failure to complete assignments. Although I don’t believe that Ruhle’s dalliance with Missouri had any effect maybe it did given that the team plays so lackadaisically at times. This team had little wiggle room before last night. now they have none. I thought Temple was an 8-4 team in July and still think that’s the case. While I think many of your concerns are valid, I still think a number here are both overestimating and underestimating your squad. I went through exactly what you’re going through with Rutgers from 2005-2011. It’s hard to quantify chemistry and leadership; they have to develop over time and under the right conditions. You lost that ‘X’ factor to graduation and many here thought talent on paper would simply trump that. It doesn’t. Team’s don’t exist in vacuums; your opponents also often have talented players as well. While I think it’s fine to expect more and Thursday certainly was winnable for you, I think the expectations to ‘beat’ the ’15 squad was a bit unfair if not outright unrealistic. …that being said, one beautiful thing about your league is outside of Houston, no one is really *that* much better. Beat USF and your season takes a drastic swing upwards. In answer to your question, which I’m sure was rhetorical, 21-23. I think the final 6 games this year are going to be a good indicator if a .500 team is the best Rhule can produce long term. Navy is decimating Houston. Get these warm weather teams in adverse weather conditions and they fall apart. Navy up ten with 5 minutes to go and Navy has the ball. Tu has to win out and hope Navy beats SFU. Hmm. The way Temple plays triple options, probably be better off playing Houston in the title game than Navy. USF is at Temple, home to Navy and at Memphis in consecutive weeks. The schedule is set up to favor Temple, just like it was last year. Up to these Owls to do what those Owls did. I have serious doubts based on the coaching so far. Some of the blame goes to the kids as well because they make mental mistakes at the most inopportune time. Austen Jones is perfect and then misses two make-able field goals, Owls to get the ball back with over three minutes left and they run into the punter, the defense is playing lights out and they give up long runs up the middle, they score and then allow a kick off return, they drop or deflect passes that turn into interceptions, they have a twenty yard loss and grab a face mask (PSU game) and on and on. One could say that a better coached team doesn’t commit those errors but they do game in and game out. The difference is that the better teams have much better players who can overcome these mistakes. TU does not yet have that luxury and thus, cannot afford unforced mental errors. I thought the coaches were ok Thursday night and despite the mistakes they had the team in a position to tie at the end. Any way, Houston’s loss opens the door to a home championship game. I hope the coaches and the team recognizes that. the play-calling on the series after the fumble recovery at the Memphis 5 was horrific. Got to get Jahad the ball with a toss there, if that doesn’t work, put him in the slot the next play. He wasn’t even on the field. Typical of the coaching so far this season. Austin Jones out? What’s the extent of his injury? Jones has a torn ACL caused by an illegal block in the back on the kick-off return, one of five bad calls all in favor of Memphis. It was one of the worst officiated games I’ve ever seen. I have not been impressed with the “quality” of the AAC refs for the past 2 seasons. Too many times at home games they seemed confused, not in real control of the game, etc. “Why are ye fearful, O ye of little faith?” The Owls still have a shot at the championship if they get their ship together. This loss seems to be a lot like the PSU loss. We definitely could have won, another 7 point loss, too many mistakes and yeah, bad refing. And now look at Penn State looking good. They’ll win at least 7 regular season and Temple can still also. But they need to clean things up. We really could’ve been 5-1 or 4-2 right now. Any confidence I had is dwindling fast. Still hoping for 7-5 but not feeling it will happen. Go Owls. Very frustrating game. How does Ryquel only get 5 carries and JT only 15, he is a Sr. and the best player on the team, give him the ball!!! Also, lost in the frustrating loss was the incredible performance by Hasson Reddick, it was Lawrence Taylor-esque. Hasson may be an NFL first rounder, a treat to watch. Up to the players now to right the ship. They should know now this isn’t 2015 and they don’t win just by showing up. Team leaders need to take charge. If the players were worried about losing the coach, they’ve taken of that possibility for another year or two. They need to challenge the coaching calls and personnel moves and challenge one another to do it and do it right. Start with Saturday by demolishing UCF. What’s your scouting report on the new place kicker? We use the contributions to pay off our subscriptions to USA Today and Getty Images that allow us to use copyrighted photos on this website. Being able to continue this website depends upon your support. Thanks for your help. It is much appreciated. 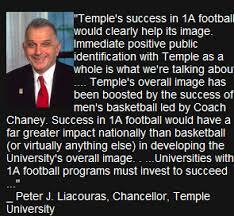 "Temple's success in 1A football would clearly help its image. Immediate positive public identification with Temple as a whole is what we're talking about. .... Temple's overall image has been boosted by the success of men's basketball led by Coach Chaney. Success in 1A football would have a far greater impact nationally than basketball (or virtually anything else) in developing the University's overall image. . ...Universities with 1A football programs must invest to succeed ..."